Microcenter in store Ryzen deals... 2700 $230 before $30 combo discount, 1600 for $99, etc. Discussion in '[H]ot|DEALS' started by elite.mafia, Jan 18, 2019. These deals are about as good if not better than the black friday deals. I picked up this combo for a friend a week or so ago Denver MC. It pretty much smokes anything you can get online. I would also point out the store rep confirmed the $30 off also applies to openbox/refurb motherboards for the combo, not just BNIB. I would also point out the store rep confirmed the $30 off also applies to openbox/refurb motherboards for the combo, not just BNIB. 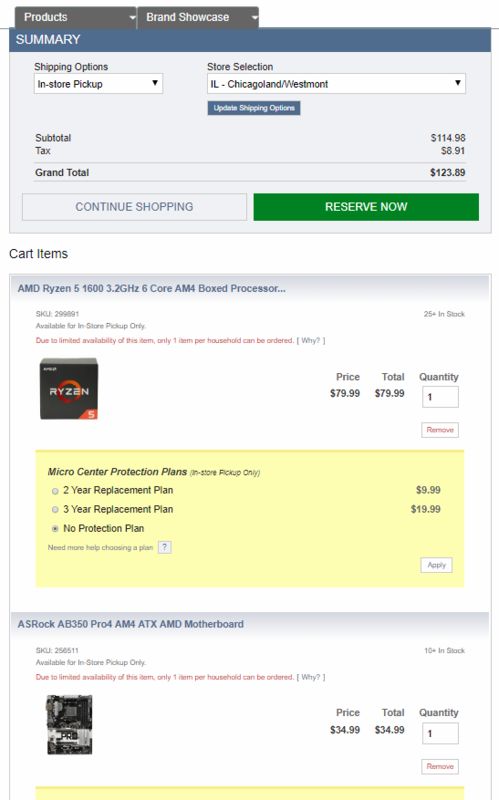 Unless they changed policy, openbox only gets combo discount if they don't have new version of the motherboard in stock. I picked up the 1700X on Black Friday, with an ASUS B350 STRIX motherboard. 1700X was $129 and the STRIX was 50 off instant ($79), minus $30 combo. With the $5 off coupon, the combo was $175, and like $188 with tax, out the door. I got it for my brother. Now, I'm in the mood to build a new PC and kicking myself for not getting that deal! $188 out the door for 8 cores with MB that's madness. Flogger23m, crazycuz20 and elite.mafia like this. They must of. my friend grabbed a random openbox motherboard and I stopped him saying No its only bnib. clerk corrected me and said nope any board. Combo discount on open box mobos I think varies by store, since the markdowns need to be done manually by a manager anyway. I'm pretty sure the Cambridge location doesn't do $30 off on open box boards, but if anything, the promotion they run is generally better, which is 50% off the original price on open box boards. There's also a $5 off $30 in store coupon from retailmenot. It will take $5 off the processor. NJ location allows combo discount to be applied to clearance/open box items. Just ask for a manager override: have gotten this without a problem 4 times over the past 2 years. I snagged one of these deals a bit back but got it for less ($120 I think) due to some other stacking discount that is available to...can't remember what it was but it popped up during check out when I was scheduling the instore pickup. Awesome deal with an ASROCK mini-ITX mobo for a SFF system. 1. understandable, mines only 15 minutes away. 2. it only takes a day to run stress tests and check features and they give you 15, i think. 3. yeah only for my personal builds im confident i can test. for friends or others id buy new. microcenters openbox deals are crazy sometimes. i almost snagged a 9900k for $400 the other day already gone today. that new maximus z390 thats 400 something was open box 275. my gtx1080 i got openbox for 500 a couple years ago full warranty. smoking deals if the manufactures rma is solid. Same, my Microcenter is 15 minutes away so the open box/clearance items are a no brainer when they are well priced. Bought a 2700X during black friday open-box for $199.96 + 3.5% tax; boosts to 4.3K with XFR2 enabled all day without issue! Also, just bought another 2700X 2 days ago and it was $280 BEFORE the $30 combo discount, not after, so a bit more enticing a deal than what is in the OP. I just got a 2700X over the weekend at the PA MicroCenter. It was $279.99 before the combo discount. The motherboard I got was also about $25 to $30 cheaper than any of the online vendors. Then again, I live 5 min so I'm sure I've spent my share there. 1600 down to 80 bucks. Emptying stock for Zen 2? Flogger23m and dvsman like this. I poicked up a 1600 and Asus Strix B350-F board yesterday for $150. Looks like I'm heading back for another $20 off. What is the time limit for refunds like that? $80 1600 is an insane deal.... no reason to even look at Intel with prices like these. Yep sweet deal. Local Microcenter shows the 30 off mobo combo when I add the 79.99 1600 and mobo to the cart! I was thinking about building a 2600 or 2700 system but it's hard to pull the trigger when my current system is fine and knowing that the 3000 series is only a few months away. If you get too impatient, you could get the $80 1600, a good board and upgrade when the 3000 series comes out. Well I was looking for an upgrade from my 7700k. It would be a nice upgrade for my son's old i7-870 though. You could still, conceivably, get the 1600 with the good board, upgrade his box with it then once the 3000 comes out basically just switch boards where he gets the 7700k and you get the good board with the 3000 series cpu. But that's only if your son is impatient and his impatience makes you feel like a bad father, burning a hole in your soul which compels you to do this for him...... otherwise I'd just say wait. I'm seeing Ryzen 5 1600 for $79.99 AND $30 off a board! elite.mafia and Dayaks like this. Ninja edit: Actually, I don't. My wallet will kill me. Yep. I did the Strix board for $10 more, because the Asrock has some HORRIBLE reviews going for it. Yeah, I bought a 1700x from MC last year and it was a pretty hefty downgrade from the 7700k. That's why I'm waiting. looking to upgrade my i3-2120... think this would be worth grabbing? I don't think my wallet would kill me. My wife would though. I Wont play games the 3 free games came with my Amd Radeon VII I'd trade for someone times go get parts and mail em out to me. I don't have a Micro Center, Where I moved too few years ago. Closest one is 4 hours away. I'd be more then happy work something out. Yes, a massive upgrade. You're going from 2C/4T to 6C/12T. Passmark score for the 1600 is 3x your 2120. But, what is your intended application for this PC? For example, if all you do is internet and word processing, keep your 2120. Me Too! Cant wait until i get back home and can go to micro center! holy crap the ryzen 1600 is so cheap right now, $80 - $30 mobo combo = effectively $50 for the cpu. Can get a board for about $60 or so. Insane pricing for a pretty damn powerful chip.